SPLINTR are fabricators for furniture, lighting and commercial interior projects. SPLINTR are happy to work with prototypes, sample runs and batch production. You can get in touch at any point during a project with as little as a simple sketch through to completed CAD drawings. SPLINTR works with a range of clients producing bespoke objects for the home through to interiors for commercial projects such as shops, cafes and bars. CAD files, Adobe suite, Sketches, Microsoft Office, Apple iWork, All image formats. 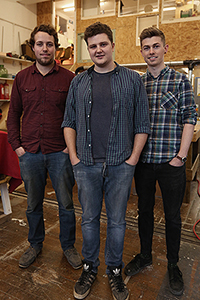 After the Steve, Jack and Francis graduated in Product Design from DJCAD, they decided to do what they had always talked about and begin a business together. Their passion for making paired with the confidence of being awarded ‘Best Stand’ at the New Designers fair, they were inspired to take the leap. The business quickly expanded and the team took up residence in a large workshop in the centre of Edinburgh.